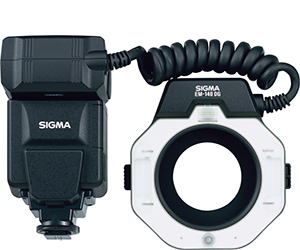 The Sigma Corporation is pleased to announce the new ELECTRONIC FLASH MACRO EM-140 DG for Sony and Pentax cameras. ELECTRONIC FLASH MACRO EM-140 DG is designed to work with both AF 35mm film and Digital SLR cameras. The EM-140 DG Macro Flash is ideal for photographing subjects in fine detail when the shadowless mode is used and is extremely effective for scientific and medical applications. Dual flash tubes can fire simultaneously or separately. Using only one flashtube creates shadow, which can give a three-dimensional feeling to the subject. The flash features a guide number of 14 w/ISO 100. The Modeling Flash function makes it possible to check for reflections and shadows before actually taking the flash picture. A wireless flash function is also available, when the EM-140 DG is used as master and the EF-530 DG SUPER as a slave unit for creating fine shadow details. High Speed Synchro and Exposure compensation functions are also available for advanced flash photography.